Manage your house's lighting, shade, security, and more with home control systems from Soundvision Systems in Lincroft, New Jersey. Our services are guaranteed to give you no less than total convenience. 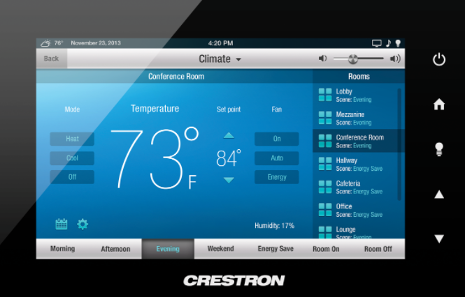 Crestron™ provides energy management that is Integrated by Design™. Through leveraging engineering and design expertise, we give you everything you need to integrate lighting control with all other electronic functions in your home. Additionally, in place of conventional thermostats, interface for Crestron thermostats are provided for total climate control. Both lighting and temperature control work in tandem to let you manage energy consumption efficiently. Automated shades lower utility bills while increasing the home's value and security. 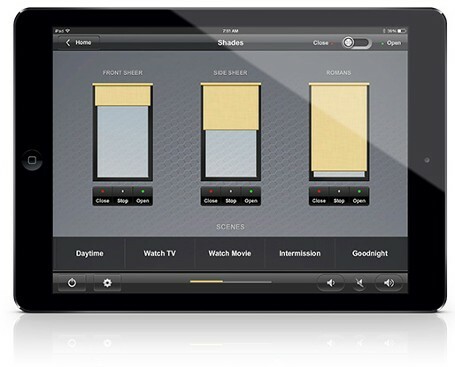 Crestron's motorized shades go the extra mile by also providing beauty, convenience, and comfort to your home. Sporting proprietary Quiet Motor Technology™ (QMT) that features a brushless motor design, our shades combine silent operation with the convenience of one-touch control. Brushes in DC motors wear over time, causing the motor to fail. QMT's brushless motor provides greater reliability, ultra-quiet function, and a much longer lifespan. Because of this, we confidently offer a lifetime warranty on our Crestron motorized shades. Striving to be at the forefront of innovation, Soundvision Systems in Lincroft, New Jersey, provides home automation software that lets your mobile gadgets directly interact with your house. We also install control systems with expanded functionality for commercial establishments. Contact us in Lincroft, New Jersey, for home control systems that take energy management into consideration.